The Millennium Falcon returns in the Classic Kenner sizing with three exclusive action figures! Electronic light, sounds, and motion-activated engine effects. Opening storage areas for Nerf darts in the mandibles and a pop-out gunner station make this one of the most action-packed Star Wars vehicles yet! It's a big one! 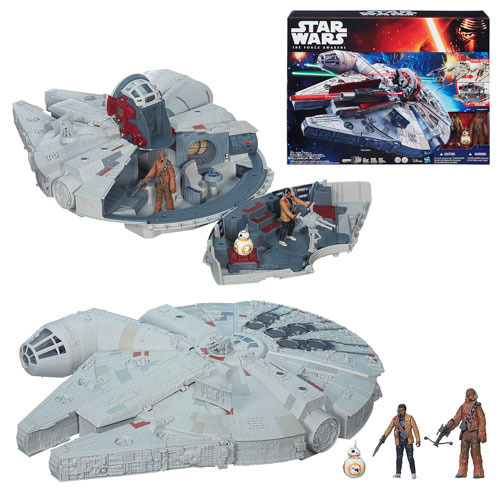 The classic hunk of junk is back with the 3 3/4-inch scale Star Wars The Force Awakens Millennium Falcon Vehicle. This awesome action figure vehicle features a firing Nerf launcher, fold-out sitting areas, and even has three exclusive figures - Chewbacca, BB-8, and Finn! Hasbro's most action-packed vehicle yet has adjustable Hyperdrive sound effects and fires real Nerf Elite Darts. It's the biggest hunk of junk in the galaxy - and now it can be yours! This amazing vehicle includes 3 3 3/4-inch scale action figures, 2 weapons, a removable cannon, and 2 Nerf darts. Requires 2x "AA" batteries, not required. Ages 4 and up. Some assembly and sticker application required. Fun and exciting.